The Taipei Metro tries to be environmentally friendly. It is a reliable and safe system. The system is underground and elevated sections. The subway in Taipei starts operating at 6 am and is open until midnight. The frequency of the trains varies from 1.5 minutes to a maximum of 15. During the holidays and special events extends its hours of operation. 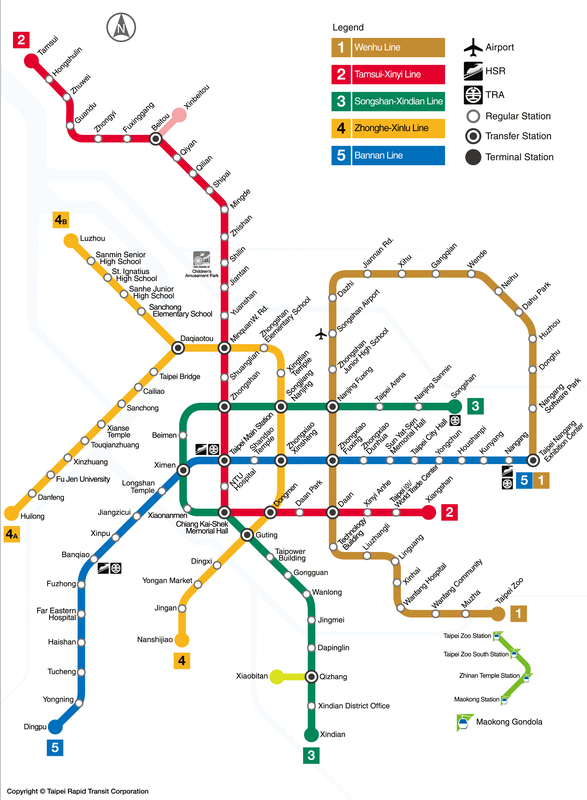 The lines of Taipei Metro have a radial arrangement. That is, they circulate from the center to the periphery. Metro lines are recognized by their color and name. It's the brown line. It stretches from Taipei Nangang to Exhibition Center station. It serves 24 stations in 25.7 kms of line. It has underground and elevated stations. It opened in March 1996 and operates at a speed of 80 km/h. It's the red line. There are 30 stations on a 32.3 kms route. The commercial speed is 80 km/h. This line has a branch, the Branch Xinbeitou. From the Tamsui line-Xinyi attractions like Fort Santo Domingo are reacheables. It's the green line. It's a 20.7 kms route serving 20 stations. It has a branch, the Xiaobitan branch. Its average speed is 80 kms/h. It is the orange line. It serves 26 stations in a 29.3 km route. It's the blue line. It stretches from Taipei Nangang Exhibition Center to Dingpu. It serves 23 stations in a 26.6 kms route. The price is based on traveled distance. For example within 5kms you should pay NT $20, between 5 and 8kms NT $25 ... anf so on until the maximum rate is reached, which is NT $65 for a 31 kms trip. Users can buy single tickets and/or tokens, which are valid for a single trip. In every station there are vending machines where you can buy them. The tokens are returned at the end of the trip. There are also passes for a day (One Day Pass) allowing unlimited travel on the subway in Taipei for a day, from the validation time of the same day until midnight. The price is NT $150. They can be purchased at any information desk at the Taipei Metro stations and are valid for a single user. The 24 hours Taipei Metro Pass is valid for 24 hours after first use. It costs NT $200. It can be purchased at the information desks of the Taipei Metro stations. It is valid for a single user. Group tickets are also available and a discount of up to 20% applies for groups of 10 or more people. It's limited to groups of until 40 people, where the discount would be 30%. These tickets must be stamped by TRTC (Taipei Rapid Transit Corporation). They can be purchased at the information desks of the stations. Concessionary EasyCard for people over 65, people with disabilities and children between 6 and 12 years. As in previous EasyCard 20% discount on travels by subway and a discount of NT $4 transfers by bus is obtained. There are other passes and rates as the Taipei Pass. To view all updated information you can follow this link. Park and ride stations are in almost every station in Taipei. With EasyCard you can park in up to 21 stations. There are areas reserved for women at stations (so they can be safe waiting for the next train at night). There intercoms in all stations and trains to contact security personnel. There are free and paid access in all stations. The public address system in the Taipei Metro is in 4 languages: Mandarin, Taiwanese, Hakka and English.